A launch that to me was near perfect! I think pictures speak louder than words. Xh (anoop) has clicked some great ones. Click Here to see lots of them. Also, Varun, Gazal ,Bimal and Prats have blogged about it. Click on their names to read what they said. I was very impressed with R.K Misra, (yes he has a blog too) who is so down to Earth, Humble, with no celebrity airs, despite having achieved so much. He means what he says.He brings professionalism and transparency to public governance and leaders like him is what our country needs. He started a movement called “Change India” after winning the Lead India Campaign from among 36,000 participants. His idea of a ‘private-public partnership’ has resulted in improving the lives of thousands of Indians. To know more click here. The Media coverage too was excellent. (click on each article to enlarge and read) But more than all that, I felt so happy to see my friends whom I had connected online. They made a special effort to come for the launch. Many had carried lovely gifts for me and the children. I felt really grateful to the people who made an effort to come—especially so, as many people whom we thought would surely come didn’t turn up. (Just like what happened at Pune) So I’d like to make a special mention of the following who not only came, but hung around till the very end and waited for me till I finished talking to the Media and posing for the paparazzi. Anant: I had written about him. Click on his name to read it. Prats : It was great meeting her. Apart from gifts for the kids,she also gave me a perfect egg shaped paper weight made of marble with a note that said “Wishing you lots more Manuscripts to weigh under. All the best”.I was touched by her thoughtfulness. Chandini: She is not a blogger. I have blogged about her. You can read it by clicking on her name. 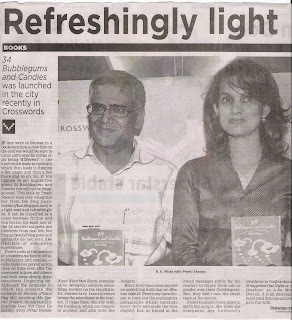 She postponed her trip to Mumbai just so that she could attend my launch. Varun: He left so quickly as it was his dad’s birthday the next day.It was great to meet him. Pratima: I had been interacting with her online. She gave such cute Mugs to my children.My daughter now has 4 glasses of milk a day, without any murmur, because she liked the mug so much! Thanks Pratima! Gazal: She too hung around till the very end. Karthik: he came all the way from Chennai to attend my launch! Praveen: it was nice to meet him. Bimal : He has been very encouraging.Always reads what i write and encourages me to do better. 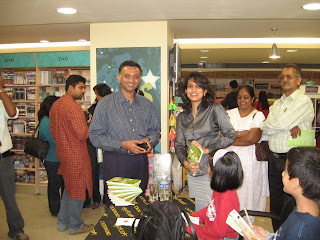 Nikhil: That ever smiling enthusiastic bundle was a joy to meet and he has been helping me a lot with my book promos. Prakhar: He looked just like his picture :-) Not that he ought not to—but as soon as I saw him I recognized him. Sushma: Who said had b een reading my blog a lot. My oldest friends Hrishikesh who I went to school with, and Jen whom I went to college with,(see pics) turned up—and I felt so happy! I was meeting Jen after 13 years, and Hrishi I had met a few months back, after 17 years! There were many more well wishers—I felt great that they took out time and made an effort to come for my launch. Too many names to mention, so forgive me if I have left out yours. A big thanks to you all--not only the ones who attended the launch but also the ones who continue to read and and connect with me. 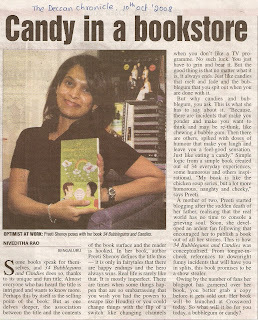 The Bangalore launch was just awesumm... Congrats!!!!! I was attending my first ever book launch. There was absolutely no way that I could have missed it. It was an awesome experience and my pleasure. Lovely to hear about the launch. I am Kavitha and a regular visitor to your blog. I have read all your articles and just loved it!! 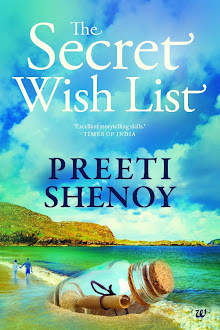 Congrats on your first book release and eagerly waiting to read the book. Was super excited to meet you. the pleasure was entirely mine..meeting you was great..
Prats:Why is the owl thinking? I felt great too. Nikhil : :-) Thanks for staying back and I do appreciate it, esp as it was a working day for you. Bimal: Thanks for rushing from work and so happy that you sat through the entire launch. Anant: the kids were super thrilled to meet you :) for them it was a character whom their mama told them about, coming alive! i was also happy that we got some time together. Kavitha:Thanks so much!I apreciate your telling me. Saw all the pics xh uploaded.. Great going.. It was nice of u to remember and mention my name though u've met me only once there at the launch. it was an enjoyable experience especially the reading session where u read out those witty and sometimes touching stories from the book.I owe a special thanks to your kids for that cute personlised bookmark..give them a pat on the shoulder each on my behalf. Praveen: Well, even thought I met you only once, what mattered was that you made an effort o come and most importantly you kept up your word.What episodes made you laugh? The kick in the night one? Manasa: Well--I don't know when! Anant: :-) Yes--very few got two. 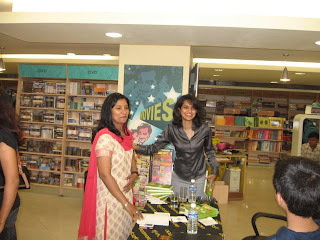 hey P, it was great to see another sucessful book launch in Bengaluru. I just finished 1st round of readin the book and with your permission may i point out to some print mistakes i encountered on page 39 and 43/47 i guess. some text missed!! u r good at guessing..i think u got it right since I told u that i started it today and must've read that story..
and yeah..lots of my pages were jumbled..had a hard time figuring out the order..cos the 1st page of each story doesn't have any number..
Praveen: Omg! I did notice a copy there where pages were jumbled and kept it aside. Do get yours exchanged.And crazy is each person's perception :) Eevryone believes they are sane! It was great meeting you all. The launch was wonderful. I really enjoyed the whole event. You were super cool!! And the bookmark is so superb. Thanks to Atul and Purvi. Will meet in Chennai again. BTW when is the Chennai meet?? it is not a surprise that your book is a big success, just like your blog, you look so confident, and young and of course, goes without saying, beautiful!!!! are you having launches in any other cities? How I wished I could be there? 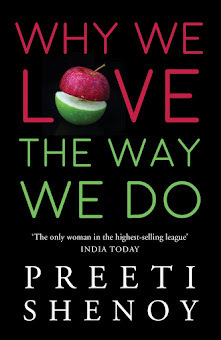 I am sure I will be the last to read you book though...hopefully by mid Dec when we are in India. Vinoo: Thanks so much.Yes--it woudl ahve been great if you could have made it. Suma:Thank you thank you and thank you [I am sounding repetitive too :-)]Launches in other cities are on the agenda but for now i need to take a breather--it has been really really hectic to say the least. Priya:Wow!What a fabulous compliment.Thank you!! Hope the launch was successful!! I am sorry, i couldnt make it. Unavoidable circumstances! But will make it a point to pick up a copy on my next visit to Crossword. Book is really beautiful,..written with honesty nd faith..nd the emotions..well it were in your voice too..when you read the stories! Enjoy writing many more...next is fiction i read? Sorry seems like too trivial a word..but i donno any word that can make-up for the blunder...specially coz ur lovely kids put so much of effort into it. I'm not sure why my friend din't turn up for the event.. :(My sincere apologies. Pls let the li'l ones know too...that i apologise to them. n Kindly throw away the bookmark..I'll collect it someday somehow. I know u'll be bugged..but have to let u know that I'm truly happy that things are going the way they are with the book! Pavi:Its ok..It wasnt in your hands.Will tell the kids. Prakhar:Thanks so much..yes next one is fiction. 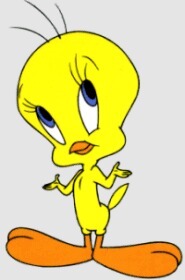 Pavi : :-) Don;t worry about it! Glad to know it went so well! I am really sorry I could not attend the launch. Was stuck in Chennai due to unavoidable circumstances. Also, Please please tell your kids that I am really sorry that I couldnt collect it. Harish:Its ok!! Please don't feel bad.Esp not on your b'day!! Don't worry about it. all the pix look fab! cud u do 1 in mumbai 2? i'll definitely b der!!! Deepti:Well its not fo a month at last- and hey-- thanks! Niall:How i wished you were there my friend. Meenu:Thank you--will do.It wont be for a month at least. The launch was fantastic - a mixture of joy & pride for me. Meeting your school classmate's family for the first time is a great feeling. Meeting them at her first book launch is even greater.